I don’t understand Disney. There are plenty of exceptional pirate bands out there, yet Disney seems oblivious. When Micky Mouse and gang decide to make a children’s album that feeds off the Pirates of the Caribbean success, rather than search for the experts in the matter, they go it alone. Sure, I know they do it so they can keep all the loot for themselves, and that would be fine if they made an album that in some way contributed to the genre. But they didn’t. Instead they made a half-hearted album of sissy pirate-esque songs that will be purchased by droves of impressionable children, who will then quickly decide that pirate music isn’t all that exciting, and never feel inspired to seek out those truly worthwhile pirate albums that don’t enjoy the sponsorship of Disney, or feature Jack Sparrow’s smiling mug on the cover. Nearly half this album’s songs – Away Away Away, Treasure, The First Mate is a Monkey, Welcome to the Caribbean, Stoway, and Davy Jones Locker – are of the most lame variety of pirate tune imaginable. 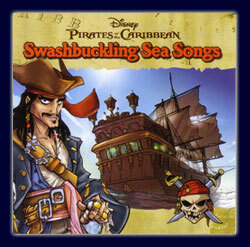 These aren’t pirate songs, they’re kiddy songs about pirates, sung by witless children’s entertainers. The songs contain no teeth, no humor, and won’t stick in your head like a decent song ought. Roughly the other half of the album is made up of pirate remakes from film, stage, and tradition – Shiver My Timbers, Yo Ho Ho, Sailing for Adventure, Blow the Man Down, and A Pirate’s Life for me. All are significant improvements over the previously mentioned songs, although each is substandard to the origninal, what’s more has been sung and resung to greater effect elsewhere. This leaves two songs that – to my knowledge – are truly original, and don’t entirely blow. The Legend of Davy Jones and Pirates of the Black Tide are reasonably decent, but hardly enough to warrant the purchase of this album by themselves. When Disney puts its mind to it, it can create genius. But all too often they just crank out garbage for a quick buck, and this seems the case with Swashbuckling Sea Songs. The music is a dud, the liner notes are filled with little known pirate facts (that you likely already know) and even the editor seemed asleep at the helm – how else would Pirate King – brainchild of Gilbert and Sullivan – be labled a “traditional” ballad? Parents seeking to start their young barnacles off right would do well to push this album aside in favor of Captain Bogg & Salty’s Bedtime Stories for Pirates. Folks seeking fun remakes of pirate favorites can get an abundance with Mallory & McCall’s Skeleton Crew Pirate Band’s Kings of the Sea. The only people that should purchase this album are those wanting to shovel more money to the Pirates of the Caribbean franchise merely for the sake of doing so. This entry was posted in Music and tagged children, disney, pirate shanties by Bilgemunky. Bookmark the permalink. Everybody’s gotta start somewhere. I bought this at Border’s one day, and liked it quite a bit, save for the last three tracks. It’s kind of annoying now, but still bouncy, lighthearted fun. This actually surprised me. I’ve sampled a lot of pirate music and this is the best I’ve heard yet. I suppose it comes down to taste. I find that I actually prefer the lighthearted, romanticized pirate theme presented here instead of the gritty reality of historical piracy. I wish Disney would release another CD just like this from the same songwriters. The original songs on this CD are my favorites, songs like Away, Away, Away and Welcome to the Caribbean. Everyone has musical taste. You didn’t like this CD, while I thought it was most excellent – far better than anything else I’ve heard on the market.